With Son and I attending the last match at Darlington’s Feethams on the Saturday, I looked around for a match for us to go to on the Sunday. 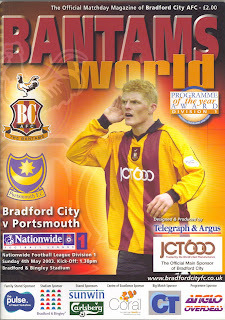 There were only the final set of Nationwide League Division 1 fixtures that day, with the most geographically convenient being promoted Portsmouth partying at Bradford. 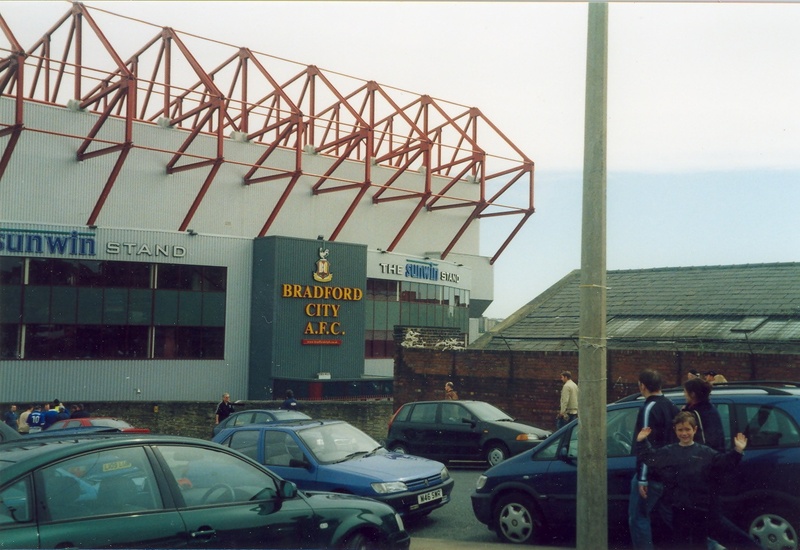 A phone call to the Valley Parade ticket office brought the news that the away areas were long sold out, and the home areas were reserved for Bradford supporters only. No allowances had been made for neutrals. I explained the situation re Darlington, and then played my trump card. 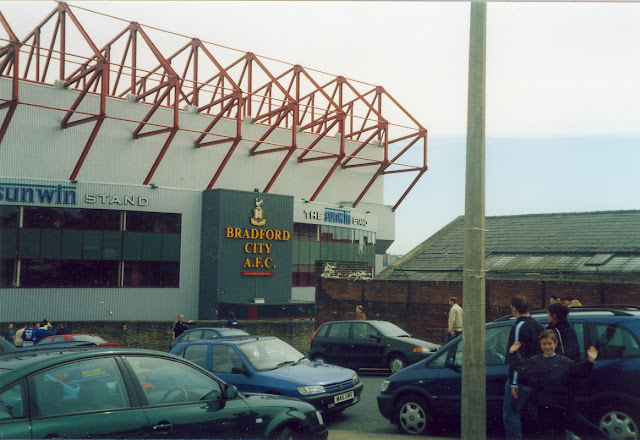 “If we cannot get tickets for Bradford, our next alternative is Grimsby v Brighton. Please don’t send us to Grimsby”, I pleaded. After a pause came the response, “I wouldn’t send me worst enemy to Grimsby, Lad. Your tickets will be waiting here for you”. A tiny victory for common sense over jobsworthyism! This in stark contrast to the intransigent harridan I later encountered at Crewe. 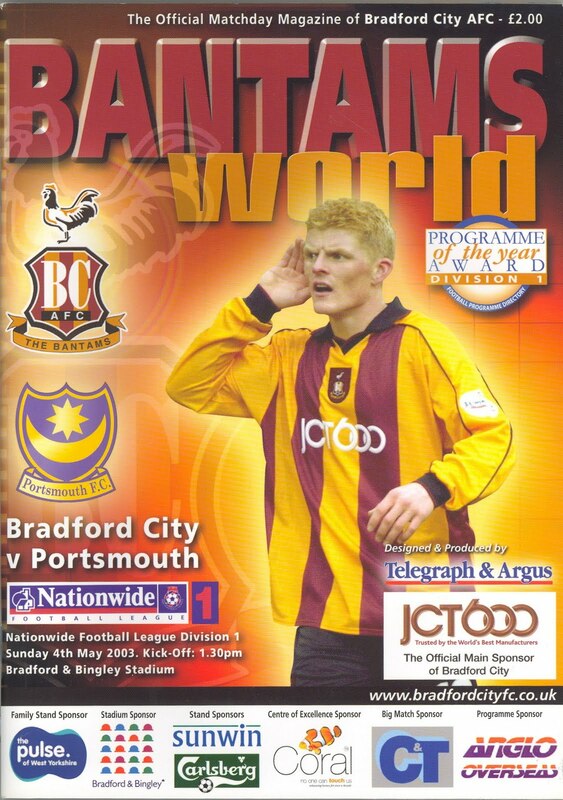 Bradford City won my prize for the silliest club mascot – the suit and bowler-hatted City Gent, but that was pretty much all they won this particular afternoon as Portsmouth quite simply ran over the top of them. Gianluca FESTA’s 25th minute opener had the visitors 1-0 up at the break, but in a 10 minute spell early in the second-half Bulgarian striker Svetolslav TODOROV snaffled a hat-trick against a set of home defenders who looked as if most of them were already thinking about their summer hols. Steve STONE, a former England International, scored a fifth on 67 minutes, after which the Pompey players effectively followed their hosts onto the beach.